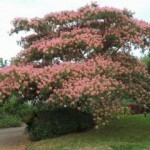 A broad, spreading tree with finely textured foliage and pink, silky, 'powder puff' blooms in the summer. 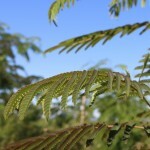 It is sometimes grown as a multi-stemmed tree. Adapts well to drought, high pH and soil salinity, as long as the soil is well-drained. It prefers a site in full sun. 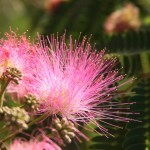 Also called Silky Mimosa or Persian Silk tree and it is a member of the legume family.